Yeah, we get it. Most of us have played a video game before, we know what to do. Even if we hadn’t, I think we are probably intelligent enough to figure it out. Pressing a button to see what it does isn’t exactly rocket science. Nevertheless, almost every modern AAA title has a tutorial, and almost without exception they are incredibly dull. Most developers seem to treat game tutorials like a chore; a mandatory but creatively unsatisfying feature that is simply a requirement in shipping a modern video game. But they don’t have to be. They can be a creative an integral part of the game if done thoughtfully. A good or even great tutorial is supposed to be an introduction, a starting point. Most games take this a little too literally. They don’t even start players on the ground floor of game literacy, they take players to the sub-basement, telling them how to do every one of the game’s basic functions over the course of the first few minutes and then shooing them along so the “real” game can begin. Maybe if we just rebranded tutorials into introductions they would collectively improve. A great “tutorial” isn’t only about familiarizing players with the game’s controls, but also introducing them to the world and characters they are about to explore and meet. Like I said, an introduction. Some games do this better than others, but there is one tutorial that I can say without a doubt does it better than nearly any other game I’ve played: Bioshock Infinite. What is so great about it? Everything. Players before reaching the tutorial have already wandered about the floating city of Columbia and taken in some of the sights. Everything seems normal; kids play in the street, paperboys hawk papers, couples chat on street side benches. Despite appearances, there is a lingering sense of discomfort that something about Columbia just feels “wrong.” Before long you arrive at a fairground, with posters and signs promoting some kind of special raffle. You see, Columbia is celebrating it’s Independence today, and you’ve arrived just in time for the festivities. Upon first arriving at the fair you are given your first vital piece of information about playing the game: the seemingly magical potions called Vigors, serving as the Plasmids of Bioshock Infinite. What are they, and what all can they do? Well step up on up and learn for yourself, the game invites, as a professional salesman standing atop the stage begins to promote his products. “One swig, and feats of wonderment are at the tips of your fingers!” The game shows, not tells, as two men dressed as devils use Vigors on one another in front of the stage to demonstrate the different abilities available to the player. Over the course of the presentation the salesman drops several names which will continue to appear throughout the game, specifically the character of Jeremiah Fink. After watching the demonstration the player moves further into the fairgrounds and discovers a small area to freely explore, filled with a variety of games and activities. Almost immediately a salesman directs your attention to “Cast The Devil Out,” a game whose name and objective, like nearly everything else in the city of Columbia, draws upon religious symbolism. It’s here players get the chance to familiarize themselves with using Vigors for themselves, an essential part of combat in the game. Using the “Bucking Bronco” Vigor players are tasked with knocking “devils” hiding behind furniture into the air. Even before using it themselves the game salesman gives players his sales pitch about Bucking Bronco, explaining its potential uses and power with his enthusiastic flair. 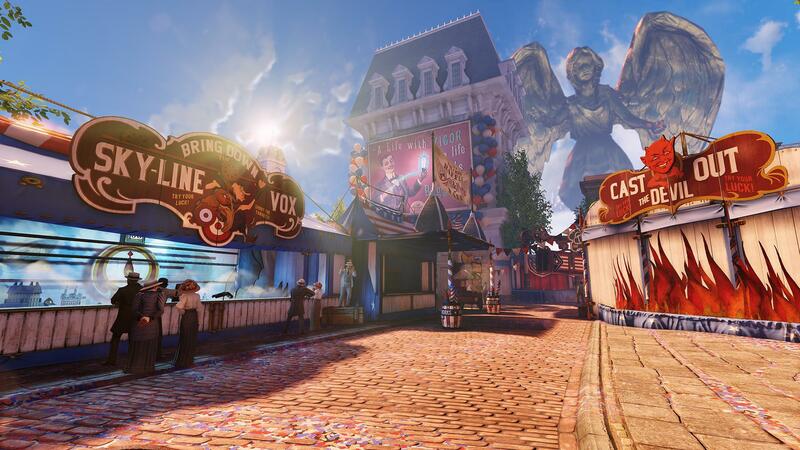 Around the corner is another opportunity to learn more about Bioshock Infinite’s combat in the form of a shooting game called “Bring Down The Skyline Vox.” Once again the game in name and purpose continues to expose players to important concepts, in this case the skylines players will be using later in the game to zip around the city and the introduction of the “evil” rebels called the Vox Populi. 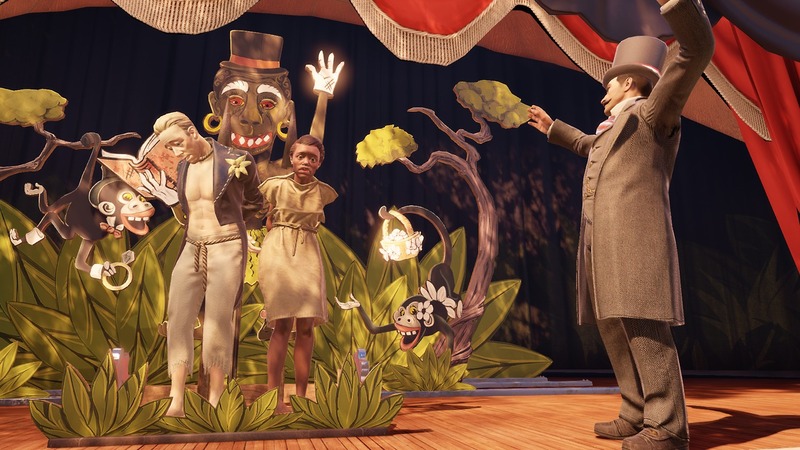 Players are tasked with grabbing a shotgun and blasting a certain number of cardboard Vox Populi targets off the rails, letting players familiarize themselves with Bioshock Infinite’s gunplay. Often times concepts important to understanding the world of Columbia can be found in the fair multiple times, just in case a player misses out on one activity. In addition to the skyline featured in the shooting gallery, a non-interactive exhibit discussing Columbia’s skylines and their use in transporting goods is also on display. An additional shooting game continues to reinforce the idea of the Vox Populi as villains, even including the important side character and Vox Populi leader Daisy Fitzroy as a special target that can be shot for extra points. Better yet, doing well in these “tutorials” cleverly disguised as carnival games grants you rewards like additional money. This gives players an incentive to actually explore everything the fair has to offer. Even after playing all the carnival games there is still plenty left to see. An exhibit with mechanical horses show the technical capabilities of Columbian inventors, paving the way for the game to introduce the heavily armed motorized “Patriots” that players fight later in the game without having to overly explain why. The game’s audio logs, Voxophones, are introduced and explained in a humorous way with player character Booker recording a Voxophone of his own and then spouting the line to the salesman, “Just so we’re clear, I’m not paying for this.” The colossal Handyman, one of the game’s most challenging enemies, is also on display for players to witness and learn more about before having to face one in combat a few hours later. 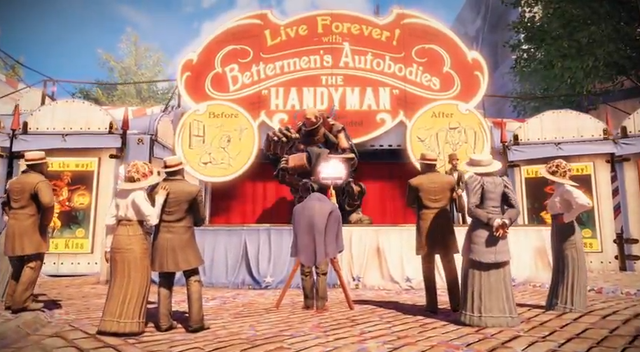 Minutes after leaving the fair comes the controversial “raffle scene.” It serves as the conclusion to Bioshock Infinite’s introduction. Picking a numbered baseball from a basket as your raffle ticket, you wait as Jeremiah Fink (the same character responsible for inventing Vigors and introduced just minutes before) announces the raffle winner. Lo’ and behold it is number 77 — your number. All the while the player is curious, “What did I win?” The reveal comes as a shock, quickly followed by a sense of discomfort and revulsion — your prize is the “honor” of giving first throw at the public stoning of an interracial couple. It’s in this moment that the uneasy sensation creeping just below the surface of Columbia comes to light. This is the real Columbia. After Fink and guards catch a glimpse of the “A.D.” tattooed on the back of your hand as you attempt to either throw the baseball at the couple or at Fink, the game begins in earnest. Players grab a skyhook and melee their way out of the area before truly starting their adventure in the dystopia of Columbia. All the information in the game’s fair “tutorial” is presented to you, not forced upon you. That is the key here. While the game does give players a quick cartoon demonstration of how to use new Vigors upon acquiring them, several of the Vigors have already been explained and demonstrated in a non-intrusive and interactive way long before players even get their hands on them. Important characters, game concepts, ideologies, and the true nature of Columbia itself have been revealed naturally as the game went along, not as walls of text appearing in the middle of your screen or journal entries. By the time Bioshock Infinite really begins, it’s likely you didn’t even realize you had played a tutorial. You were simply absorbed in the world Irrational created and ready to explore it further. Bioshock Infinite proves that tutorials can be an integral part of the game experience and don’t have to be a mandatory afterthought. 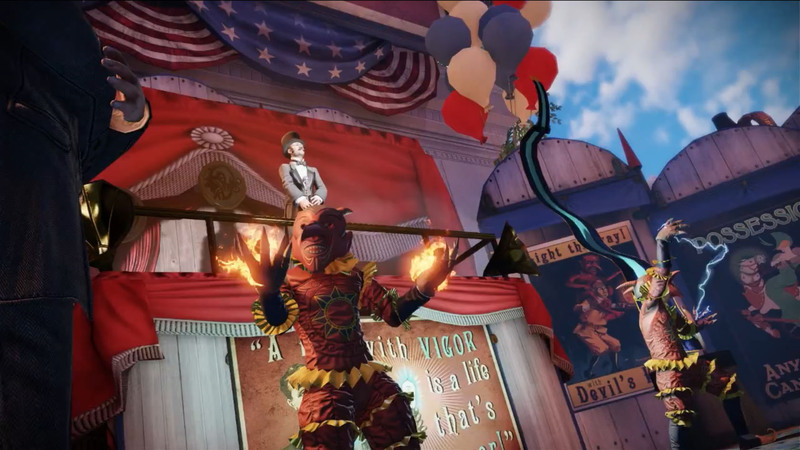 In fact, the fair, raffle,and scenes leading up to both are my favorite parts of Bioshock Infinite, even taking into account how much I enjoyed the game’s combat and dimension hopping storyline. Video games need more tutorials like this. Gamers are (generally) a smart crowd. We know how to shoot and jump. We know how to crouch. Developers, tell us something we don’t know. Tell us about the world you’ve created, the characters you’ve populated it with. If you do have to tell us how to play, make it part of the game, not separate from it. That’s all I’m asking. If you follow Bioshock Infinite’s lead, modern games will be all the better for it.